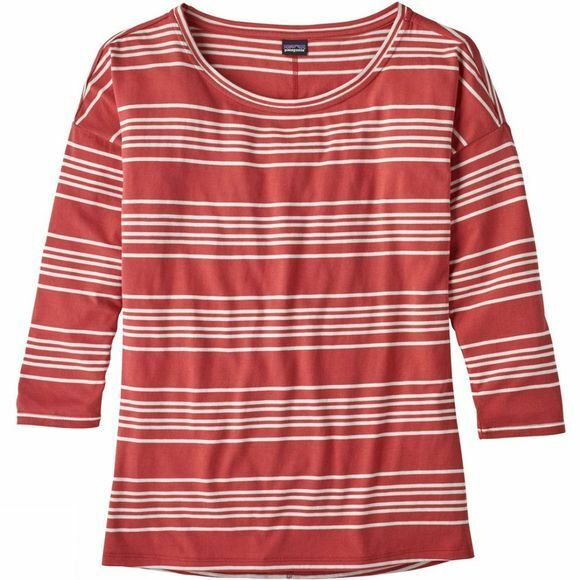 Patagonia's striped Shallow Seas Top 3/4 Length Sleeve Top is so comfortable and versatile, it will also become part of your warm-weather gear. It’s made from an organic cotton/Tencel lyocell jersey blend that places Tencel next to the skin where it wicks moisture away from the body. The shirt has a scooped neckline with dropped shoulder detail for added style. Three-quarter-length sleeves, a rolled fixed cuff and a straight hemline are also featured, with a side slit for ventilation. The top is ideal for summer beach walks as the length falls to the waist with a longer back, so it will keep you covered without inhibiting movement.